Holiday rentals, apartments, cottages, gites, villas, caravans, camping, bed and breakfast, hotels, activity holidays, skiing holidays, cycling holidays and yacht charter. Holiday locations include England, Scotland, Wales, Spain, France, Portugal, Cyprus, Italy, Florida, and the Canary Islands. 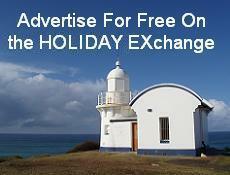 If you offer a villa or apartment rental, let a holiday home, run a hotel or bed and breakfast, have a holiday caravan, then place a free holiday listing on the HOLIDAY EXchange. Standard Listings include a picture and over 200 characters of description. If you would like a bit more exposure for your holiday try one of our Premium Listings, at just £10 a year they are great value. Short of time? Then let us create your listing with our Express Listing.